2018-05-05 To make sure the system is stable, make sure to upgrade the Asus X370-Pro to the latest BIOS and set the option “Power Supply Option” to “Typical current idle”. This will solve stability issues during periods that the server is idle and sometimes freezes. For the build I made a Time-Lapse video which includes lots of information overlays. Make sure it watch it first! For this second video I will go a bit deeper into certain topics concerning the server and the GPU hardware passthrough. One the others subjects is the included FAN PCB and getting the server to make a bit less noise! The 2x1Gbit Intel i350AM is a special PCIe x1 variant because all the other slots where full, you can check it out using the link. You can pick up a cheap Intel 10Gbit SFP+ card there too. You can find the Molex to 5x SATA cable here, or a variant from SATA to 5x SATA here. If you don’t have enough SATA data cables, pick up some of these nicely nylon sleeved ones. The system is running on Proxmox VE 5.1. The install you saw during the video was done from a USB stick and everything works out of the box. At the time of writing it was important to enable the testing repository to get a new version kernel for the GPU passthrough. Some more information about configuration within Proxmox and GPU passthrough will be detailed in another post. A lot of people asked me how I configured the ZFS pools so here is a small walkthrough. This is by no means a comprehensive guide to ZFS but mainly what I did to create the storage for this server. The board has 8xSATA-600 and 1x M.2 NVMe PCIe 3.0 x4 connectors. In this build, I’m using them all. The only expansion option that is left is replacing the 2x2TB drives with another pair of 12TB drives if needed in the future. The ZFS configuration only consists of mirrors. During the installer I opted to use the 2x 1TB SSD’s on a mirror. This should provide plenty of performance and security in the case of a hardware failure. Out of the box, the proxmox installer creates these using drive links such as /dev/sdb, /dev/sdc, etc.. I don’t really like that approach and much rather use /dev/disk/by-id links since when a change occurs in controllers, drive order or even hosts that won’t ever change. So the first thing to do is fix this. Detached the second disk and selected it from the /dev/disk/by-id link, make sure to use the correct line when connecting it to the pool, otherwise it won’t become a mirror but a stripe! All is well and working! And with that you are using (in my opinion) the correct way to connect your disks in ZFS! Now, even when you change drive order, controller or even hosts, it should be able to find all the disks. For mass data storage I decided to use the 4x12TB in one pool with two mirrors. That makes the most amount of sense with this disk configuration. Why? After creating the pool I advise to enable LZ4 compression. It works wonders on modern hardware, hardly costing any CPU and saving precious space where possible! Even when incompressible files are written it has a mechanism which gives up on compressing those files. It also changes how ZFS access the disk making things a bit more efficient in most cases. And that’s the pool done! The 2x2TB disks where added in the same way to a different pool. Although ZFS can handle different disk sizes as mirrors within the same pool I am going to use the disks for different purposes and wanted to seperate the I/O. Why the need for cache? I added the Samsung 960 PRO to use as a L2ARC for the server. During LAN parties a video team will be dumping footage and then use those files directly from several PC’s to edit videos. This requires quite a bit of speed to make it work fluently for everyone at the same time. In part, this is why I added the 10 Gigabit network cards. But with “only” 4x12TB disks which do about 200MB/sec on average that would only give me 400MB/sec on writes and 400 to 600MB/sec on reads maximum. Although those numbers aren’t bad, those are for pure sequential transfers, if multiple people are hitting the pool at the same time, you won’t reach those numbers. Adding L2ARC can alleviate some of the load on the disks. It will provide another source where it can get the blocks you are requesting. I chose the Samsung 960 PRO because of its performance using a single queue depth and because it uses MLC memory instead of TLC so can handle writes and endurance a bit better. Because this SSD is connected using PCIe 3.0 x4 it has about 4000MB/sec of bandwith and the specs of this SSD say it can deliver about 3500MB/sec read and 2100MB/sec write. Now it won’t do that during L2ARC/SLOG duty but I’m hoping it will come closer to saturating the 10Gbit or providing more I/O in conjunction with the disks then just the disks alone. It’s no Enterprise SSD so it doesn’t have a giant endurance but still a lot better then any generic SSD. It lacks any form of power protection. So using it as an ZIL/SLOG device is debatable. If you are a ZFS purist, this device cannot be used as an ZIL/SLOG device. In my opinion, unless you go the whole route with ECC memory, a UPS and/or disable disk write caches, etc. not having power loss protection on your SSD will be the last of your problems. But, decide for yourself how important the last few seconds of data are for you! Nevertheless, I have appointed some space on the SSD so I can play around with an ZIL/SLOG. Therefor I’m using the following partitions on it. Because I want the cache to have parts of most of the current media files on it, I raised the L2ARC fill rate setting. Normally this setting is set conservatively to only cache much used blocks over a long period of time and not sequential files so the SSD won’t be trashed too much with writes. If you should change this setting and if it will be beneficial for you really depends on your usage, so use it with caution! It will cause a lot more writes on your SSD and might not give you better performance! This sets the L2ARC to a max write speed of 500MB/sec and to cache everything from single blocks to sequential reads. Again, I can’t warn enough about this, these settings might be completely wrong for your installation and use case and might actually make performance worse and kill your SSD sooner, use with caution, do your own research! 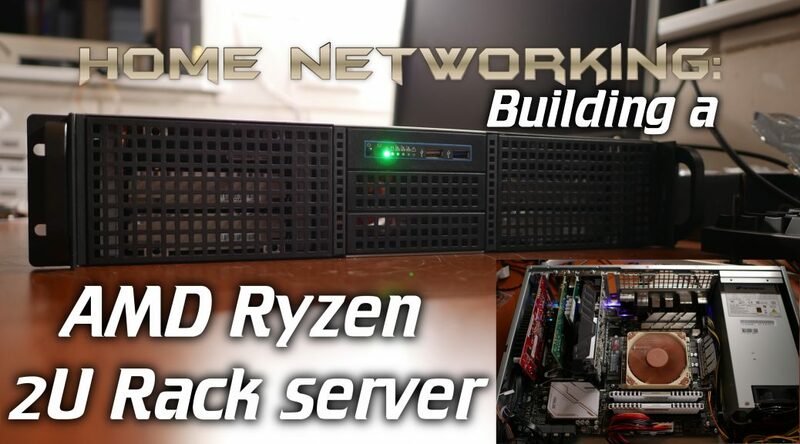 As written above, I’m going to make a second blog post talking a bit more about Proxmox and using GPU passthrough together with a video showing some hardware features and how to make this server quieter then it comes out of the box. If you have any questions or comments, let me know down below! i like to ask why you need this many ports? can’t you use the port on the motherboard for all the vms or use a software router e.g pfsense or opnsense? also I forgot to add, i like to ask if your are going to run this 24/7? and why you chose consumer parts instead of server parts? Price and noise, but mostly price. 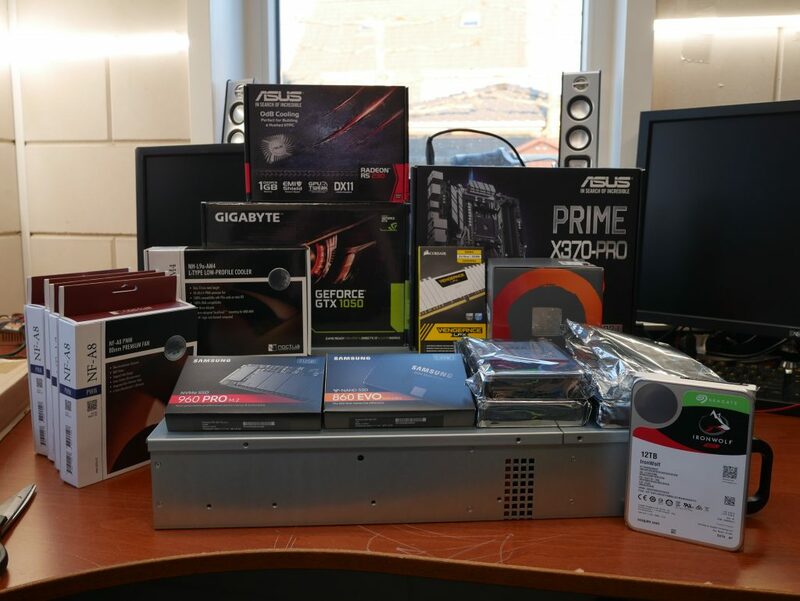 Getting a server-grade pre-built often costs 1.5x to 2x of the cost of building it yourself with desktop components like I did. There is no denying there are reasons for server hardware to exist but the environments I run these machines in, it’s no problem if after running for a while I need to replace a component which might cause downtime, etc. So they all have a purpose. Sometimes it’s just convenience though, you could of course run all VLANs over the same port, etc. but that would take more configuration and cost extra time each time we need to change it for that LANparty. thank you for sharing your thought, I think I’m going to build using desktop components like you. I think its more practical also. are you going to bridge the ports to the virtualized system in proxmox? can you add guides on your virtualized system like do you add firewall in proxmox? and how do you access the windows for gaming? do you rdp? It would be nice to know what vms you installed and their use at the lan party. Did you run a sream cache …. ? Etc. This server specifically is for running media related tasks such as some file storage containers (hosting SMB/CIFS, NFS, FTP, etc.) which use the host ZFS storage with a passthrough. The shared folders are mostly for our media time which has several members live editing and dumping footage with it. Works surprisingly well, I have several Turnkey containers which don’t have any local storage other than the boot drive and then passthrough ZFS mounts, I was able to get speeds of 500MB/sec+ no problem. Next to that it’s also running a Linux VM for our camera system NVR (again using the ZFS storage) with about 16 to 20 cameras and a Windows VM for running OBS which live streams to the internet (Encoding using GPU passthrough). It might run some more services in the future if needed, but this is basically our media machine. We do run things like Infoblox DHCP/DNS and other services but those are currently still on other virtualization servers. We also have a giant steam cache (~50TB) but because of the performance needed with 1200+ simultaneous attendees it’s hosted on another physical machine with a truck load of disks for the IOps and mutli-10Gbit access. Can I ask you what software are you using for surveillance? Also installing on ssd (860pro) caused a massive write and wearout for me. Ike 1% every week only running proxmkx, Looking around I resolved disabling 2 service used by cluster, obviously I cannot clustering this way. How did you manage this? Why did you not choose for Optane instead of the 3x SSD’s? It is faster and has longer lifetime? Although I would have loved to use Optane in this build, sadly, they are much more expensive. I wanted to have a mirror for the boot and VM drive so that’s what I use the 2x1TB for. For the cache drive an Optane module would have made a perfect fit but the nice versions are quite expensive and the cheaper versions are too slow when using 10Gbit. So a 960 PRO was a little bit of a compromise but should still last a while even with a lot of writes (that’s why it’s the PRO, not the EVO). Especially because this server has been built to use at events and thus the disks won’t be writing much between the events and thus save the NAND flash a bit. I was wondering what better options would I have with the ASUS Z-370 PRIME PRO Board. Can you elaborate please. One of the best guides around about configuring things before proxmox installation. Even though my purpose/project for using proxmox is way different than yours (I want to emulate the working environment at work which consists of a serv 2012 r2 win 7/10 clients and 2 mac OS X ) still I d like to know if you can help me about initial instalaltion. First of all my setup consists of a Dell Precision based around x 79 socket and c600 intel chipset with 64gb ecc memory 2 xeon E2667 if I can recall correctly a perc H310 controller which I unplugged it at first place because I ve read about not being able to pass trim commands. Then again the onboard intel sas controller (pci id 8085:1d6b), I m not sure that it can pass through the disks to the zfs acting as a simple hba controller) The OS is going to be stored in an 128gb ssd and have 3 more 480gb ssd’s for data meaning ISO/VMs Containers and such. According to all the above configuration which do you think would be the best possible way to set up the drives. I initially started with ext4 for OS which lost a 10-15% of space and couldnt calculate where is being placed as partioned or unpartitioned space and also created a swap file of only 1.75gb which is the opposite of what I ve read it should be in size ()i mean too small. Is it true that using zfs for the OS doesnt create swap space at all? Would I have any benefits from using zfs instead of ext4 for OS installation? I am not even at step 2 setting up the 3 ssd’s as a kind of software raid (with 3 same ssd’s what do you think would fit best) and I ve already read many doc’s/guides in forums, also videos but instead of the scenery to clear up it becomes more and more blurry…. I’m not really sure I’m completely following, but I would use the 128GB SSD as a single ZFS disk (mainly because it’s easy to use) and then configure the 480GB SSD’s in something like a RAIDz1 if you value the data or otherwise just a normal span/stripe. More advanced is that you can leave the 128GB SSD out and work with partitions so you can run a boot mirror and again use the RAIDz1 (with a bit less space) if you want redundancy for your boot partition also. By default proxmox does not seem to create a swapfile that’s correct. Because of that you should not overcommit the memory! I also don’t follow your USB question, if you want to install Proxmox onto it, don’t, it will die. If you want to use it as an extra store you can define so in the GUI. Can it be done via webui or cli somehow?